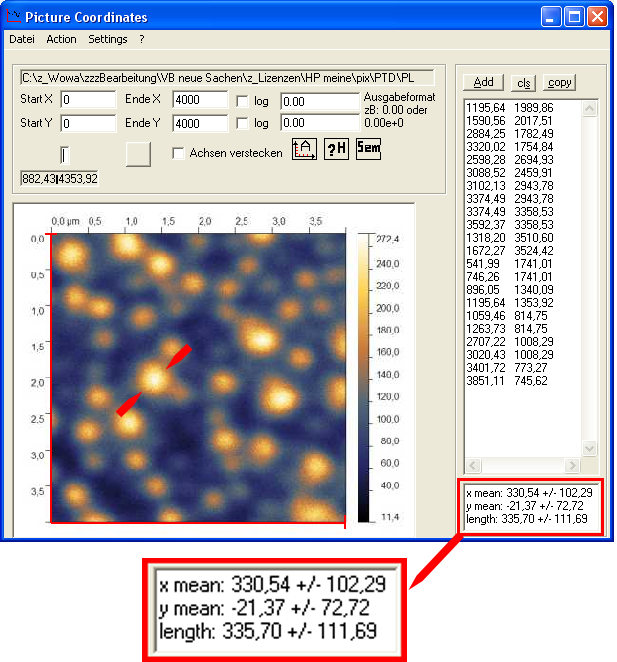 It is also possible to use this program as a distance measure in pictures with a scale bar such as AFM or SEM images. 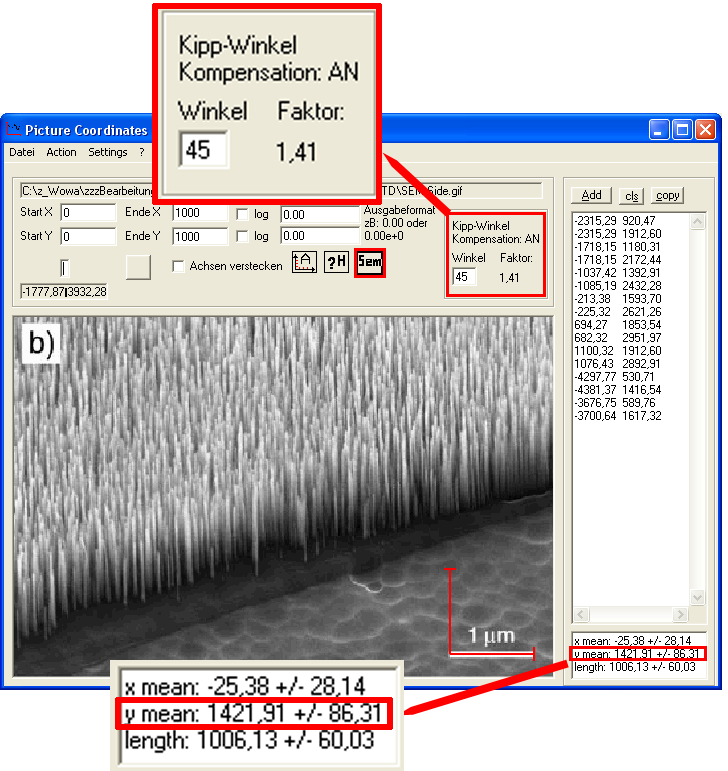 The special feature tilting correction enables height measurements in SEM images (if the tilting angle is known). At the beginning you define the starting and endpoints of the axis in the picture. Then you klick on your graph to get the data points out of it. Using the program, you can compare your measurements with results published by others. For that you need to extract the data points from their picture since you do not have the original data as text. Another example where to use the program is shown below: Say you have an image from the stock market and want to get the real numbers to work with them and to make a calculation. In this example we have a picture from the german stock index DAX, which is transformed into datapoints which you can use in Excel or other programs to make calculations or replot the data. Picture by curtesey of www.boerse-frankfurt.de. If you want to see a live image of the DAX, please klick here. Loading a picture into the program is done by drag & drop of JPG, GIF, BMP files or files from the windows clipboard (by Ctrl + v). You can use the gathered data e.g. 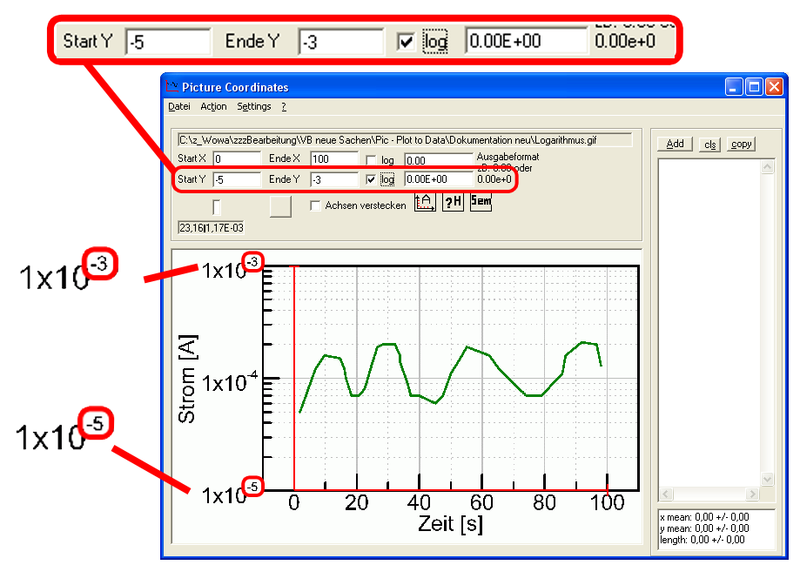 in Excell or Origin to make calculations with them or replot them in combination with other graphs. It is especially helpful when you want to compare your own data with the data from other groups. In this case mostly you dont have thier measured points, but rather a pdf or a picture from their publication or presentation. From this pdf or ppt you can easily copy a graph and paste it to Digitize Plot To Data to get the data points. First of all you have to define the axis or a scale bar in the picture. You do this either by using the mouse or the keyboard, with which an exact definition of the axis is possible. It is also possible to select whether or not the axis in the image are logarithmic. Then you can click on the picture and each click gives you data points as text. Given an image with just one scale (scalebar) you are able to measure distances with Digitize Plot to Data. This is useful in e.g. SEM or AFM images. With Digitize Plot To Data you can also get datapoints from a picture with logarithmic axes. To use this feature, you just tick the checkbox and write down the powers in the textboxes. E.g. for an axis ranging from 10-5 to 10-3, type in -5 and -3. With Digitize Plot to Data you can easily determine the size of particles or their distances in e.g. an SEM or an AFM image, where just one scale is given. After each two clicks on the picture, the program calculates the distance between those to clicks depending on the scale bar. Digitize Plot to Data also calculates the mean distance with it's standard deviation. In this photolumineszenz picture, the size of the light guides (diameter) is determined too be 335 +/- 112 nm (Mean +/- StDev). 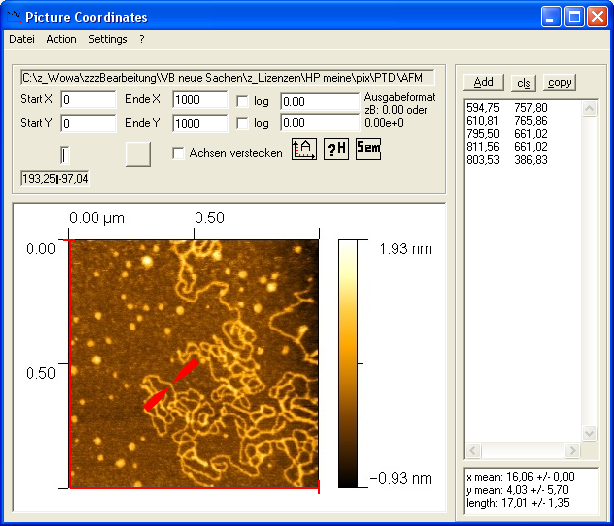 The topography of a single stranded DNA (SS-DNA) is imaged in the AFM picture here. With Digitize Plot To Data it is easily possible to obtain the thickness of this DNA: 17 +/- 1 nm. Having an SEM image of a tilted sample with let's say an etched structure such as as nanowire or a mesa structure, you are able to precisely determine the real (not projected) height of it. By specifying the tilting angle, the tilt compensation factor is calculated and applied, to give you the right value to determine the height of a structure. With Digitize Plot To Data it is possible to obtain the height of this etched diamond nanowires (picture: W. Smirnov ) The real length is roughely 1.42 µm. Without tilting angle compensation, you would obtain the projected and much smaller value of ca. 1.00 µm.